Go! Series Single Rail Stand-Up™ Motorcycle Trailer for Cruisers, incl. Harley, Goldwing, Sport Bikes and cargo. Go! Series Single folding motorcycle trailers combine the industry leading design and engineering qualities of our patented Single Stand-Up™ Motorcycle Trailer with more value-oriented materials and features to create the perfect combination of a fully functional cost-effective motorbike trailer. The Go! Series Single Rail trailer can carry one full-size motorcycle or general cargo. Each trailer is equipped with ride-on capabilities plus Kendon’s renowned Stand-Up™ folding feature. Weighing in at 320 lbs. the trailer is easy to maneuver and when in storage, the Go! Single-Rail takes up about the same space as a small bedroom dresser or chest of drawers. The Kendon Go! Single trailer features a wide diamond plate deck area designed to hold one full-size motorcycle such as Harley-Davidson, GoldWing, K1600, adventure bike, etc. When towing a motorcycle is not required, the trailer rail can be removed for general cargo towing. The heavy-duty independent torsion-bar axle and hub combination give the Go! Single bike trailer its true 1,000-lbs. load carrying capacity. The Go! Series Single Folding Motorcycle Trailer combines a steel triangulated frame with a lightweight, user-friendly, space-saving design. It’s perfect for any rider – from moto to track, cruiser to sport. Designed for bikes of all sizes and riders of all styles. Exceptional performance doesn’t just happen overnight, it’s a product of superior design and many years of testing and refinement. Kendon’s round steel tube construction and triangulated frame geometry is inspired by race car design and engineering. The result is a trailer that is incredibly strong, lightweight, easy to use and even easier to tow. And for you that means a motorcycle trailer that’s easy to stand up and maneuver in the garage. The Kendon Single Go! trailer is equipped with one loading ramp for simple push-on operation. Once the bike is loaded, the Kendon classic rail and motorcycle wheel chock system keeps your motorcycle upright so you can tie down the bike for smooth and safe towing. The lightweight ramp on the single motorbike trailer can be stored underneath the trailer for towing and when folded for storage. Go! Series Single Rail Ride-Up Stand-Up™ Motorcycle Trailer for Cruisers, incl. Harley, Goldwings and Sport Bikes. Go! Series Single Ride-Up folding motorcycle trailers combine the industry leading design and engineering qualities of our patented Single Ride-Up Motorcycle Trailers with more value-oriented materials and features to create the perfect combination of a fully functional cost-effective folding trailer for motorcycles. The Go! Series Single-Rail Ride-Up trailer can carry one full-size motorcycle or general cargo. Each trailer is equipped with ride-on capabilities plus Kendon’s renowned Stand-Up™ folding feature. When in storage, the Go! Single-Rail Ride-Up takes up about the same space as a small bedroom dresser or chest of drawers. The Kendon Go! 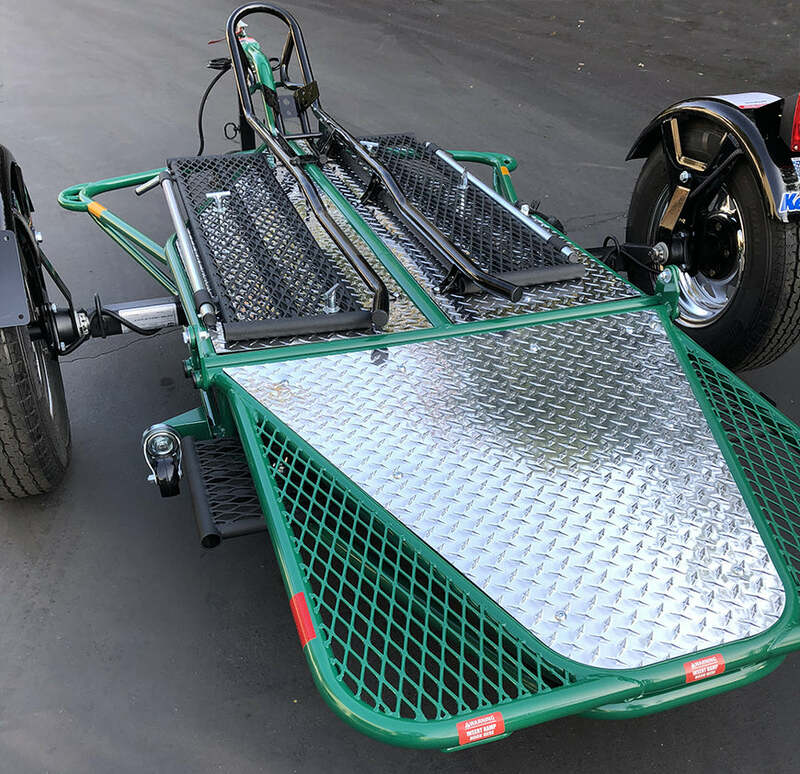 Single bike trailer features a wide diamond plate deck area designed to hold one full-size motorcycle such as Harley-Davidsons, GoldWings, K1600s, adventure bikes, etc. The trailer rail can be removed for general cargo towing when hauling a motorcycle is not required. The heavy-duty independent torsion-bar axle and hub combination give the Go! Single bike trailer its true 1,000-lbs. load carrying capacity. The Go! Series Single Ride-Up Folding Motorcycle Trailers combine ride-on convenience and safety with a lightweight, user-friendly, space-saving design. It’s perfect for any rider – from moto to track, cruiser to sport. Designed for bikes of all sizes and riders of all styles, this is the trailer for you no matter what or where you ride. Similar to it’s older brother, our hand-crafted Single Ride-Up SRL Trailer, the Go! Series Single bike trailer features durable light-weight frame geometry and suspension design that allows you to ride your motorcycle onto the trailer. The ride-on operation makes it much easier to load a heavy, full-size bike. As you ride your bike onto the trailer the integrated extensions and wider ramps allow you to put your feet down to safely load and unload your motorcycle. Once the bike is loaded, the Kendon classic rail and motorcycle wheel chock system keeps your bike upright so you can strap down for safe and effortless towing. Our Ride-Up trailer models feature wider loading ramps, wider rear sections, and additional foot extensions to provide safe foot placement as you load and unload your motorcycle on the folding trailer. The folding motorcycle ramps on the single trailer for motorcycles can be stored on the trailer while towing and while folded for storage.